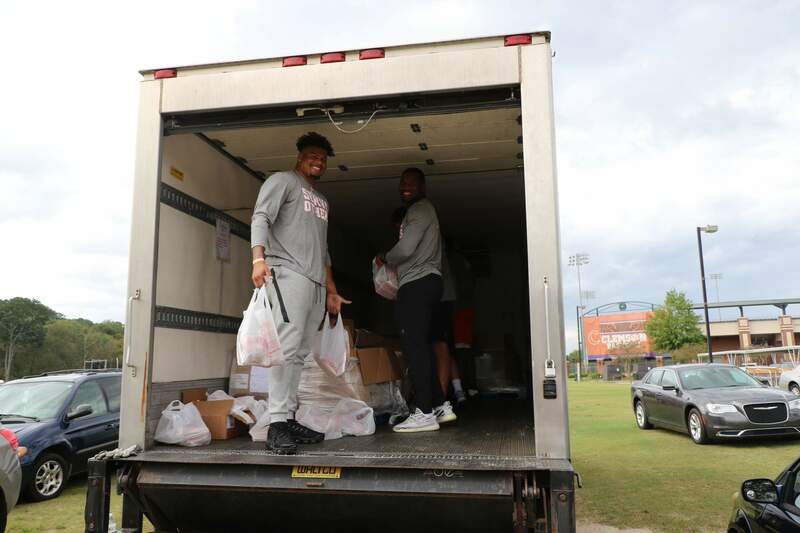 CLEMSON, S.C. — Clemson Football took to the practice field in a different capacity on Tuesday, welcoming local families to the Poe Indoor Facility as part of the team’s annual fall community service event. The event was organized and hosted by P.A.W. 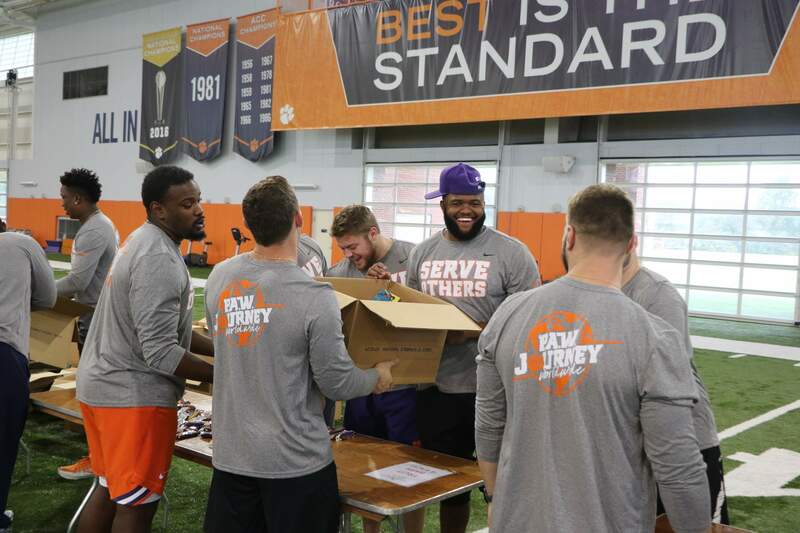 Journey, Clemson Football’s program to cultivate leadership in student-athletes through personal growth, life skills and professional development. 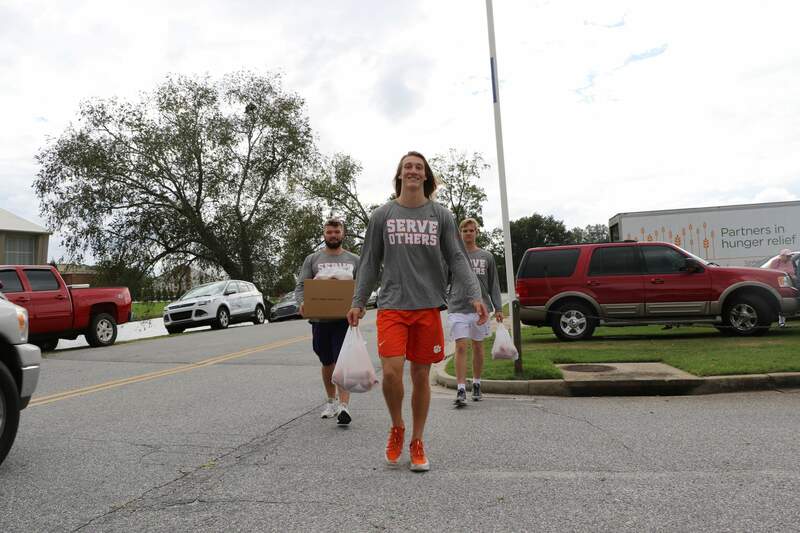 This year’s service project was specifically created using the preferences and feedback of the team’s student-athletes, helping them serve people and projects about which they were passionate. This year’s event focused on the areas of health and hunger and was made possible through a number of partnerships. 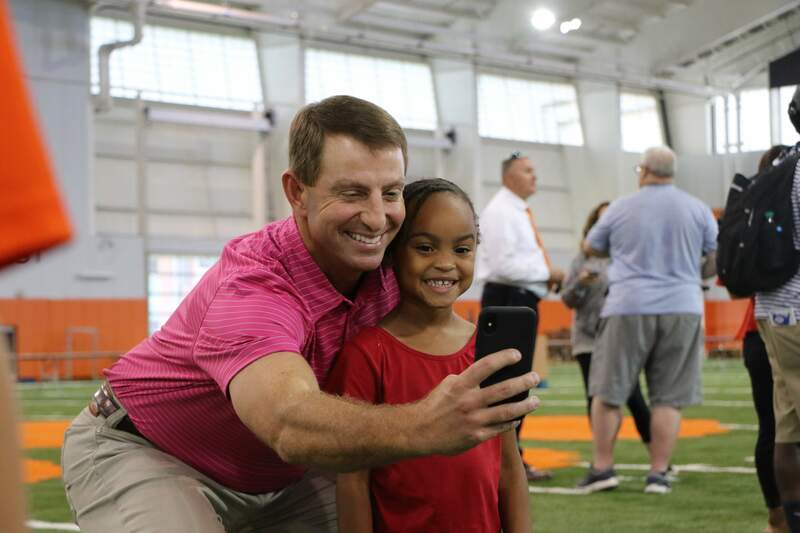 Through the Littlejohn Community Center, more than 300 families from Clemson, Central and Seneca were invited to participate in the event. Golden Harvest Food Bank provided healthy groceries for the team to assemble and distribute. 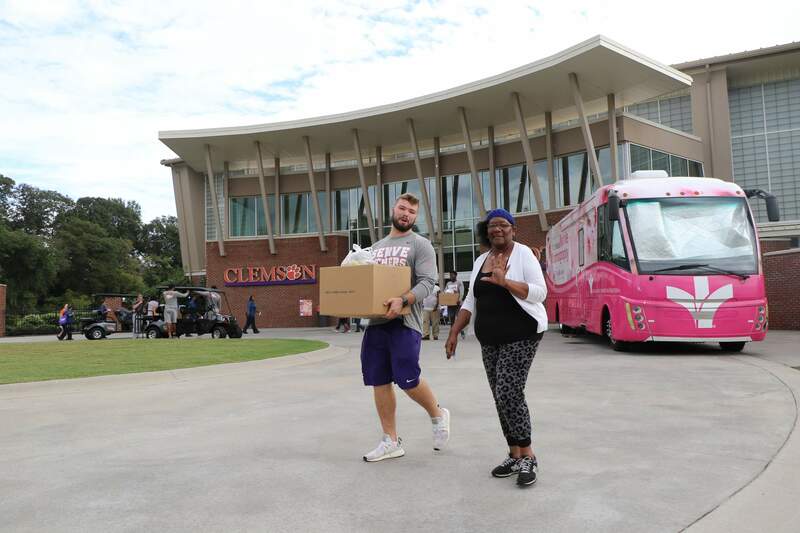 St. Francis, in connection with Dabo’s All In Team Foundation, provided women’s health screenings via its mobile mammography bus. Additional free health screenings were provided by the university’s Joseph F. Sullivan Center. One end zone played host to the Kids Zone, where Clemson players personally connected with youth in attendance and participated in inflatable games, tailgate games, football drills and more. And under the philosophy of “Look Good, Feel Good,” Clemson’s team haircare stylists were on hand to provide free haircuts to attendees. 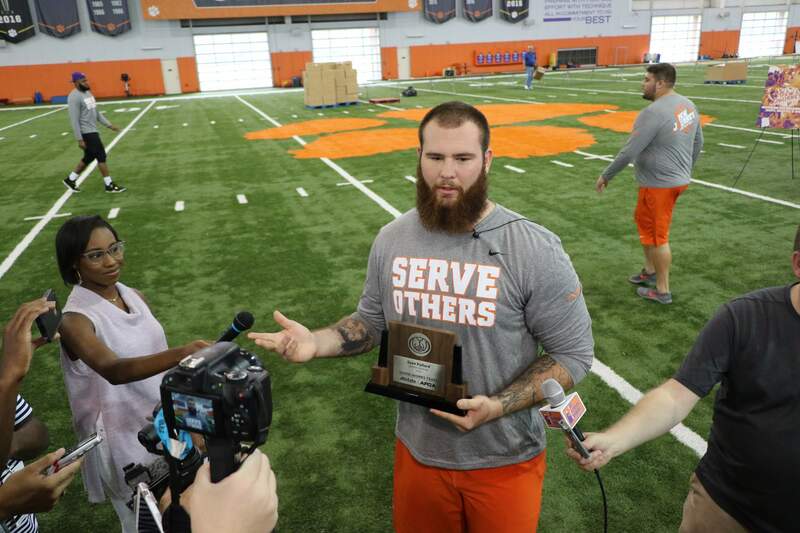 The day also represented an opportunity for one of Clemson’s own to be honored for his longstanding commitment to service, as offensive lineman Sean Pollard was formally recognized for his selection to the Allstate AFCA Good Works Team. 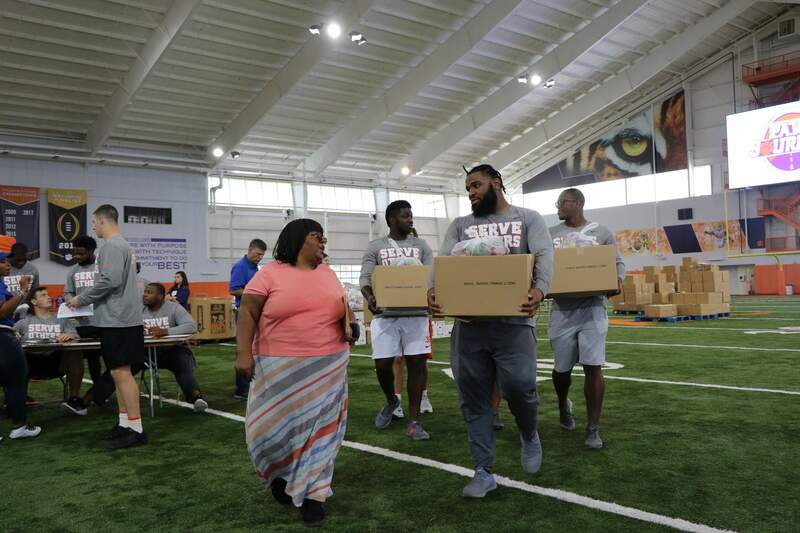 At the start of the team’s afternoon meeting, Swinney called Pollard to the front of the room, where Allstate representative Angie Devore was on-site to surprise Pollard with his trophy in front of his teammates. Voting remains open for fans to select Pollard, a junior from Jackson Springs, N.C., as captain of the 2018 AFCA Good Works Team. Pollard has been a presence in the community since his arrival at Clemson, creating and coordinating the All Off for Cancer event in 2017 and 2018 and raising more than $21,000 to provide funds and activities for pediatric oncology patients and their families. 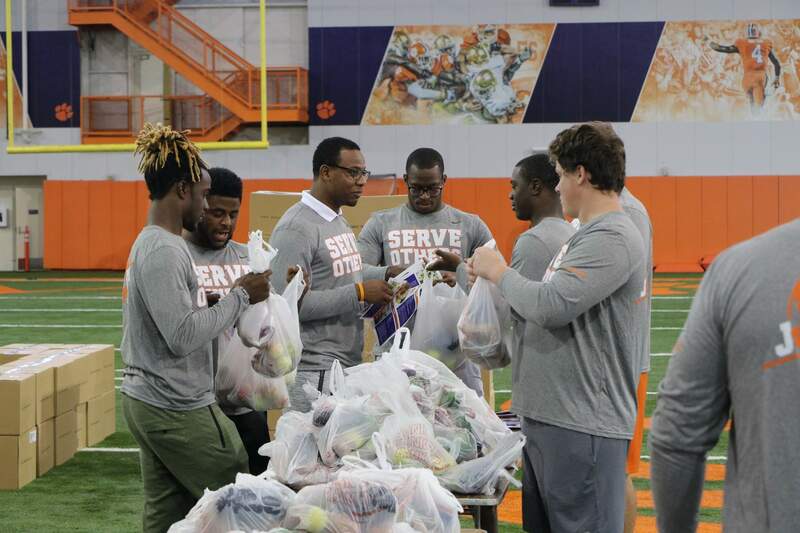 Pollard became the fifth Clemson player all-time to earn an AFCA Good Works Team distinction. He joined Robert Carswell (1999), Nick Eason (2000), Xavier Dye (2009) and Deshaun Watson (2016) as the only AFCA Good Works Team honorees in program history.